Below is a current screen shot of Domain Pigeon. How many times do you count the word “unregistered”? Four times: once in the header, once in a quote, and once under How it Works, and once under Domain Count. It also occurs again in the legend, which you can’t see, and once in the page’s title for a total of six times. This was done somewhat intentionally in an attempt to improve Domain Pigeon’s standing in Google’s search results. 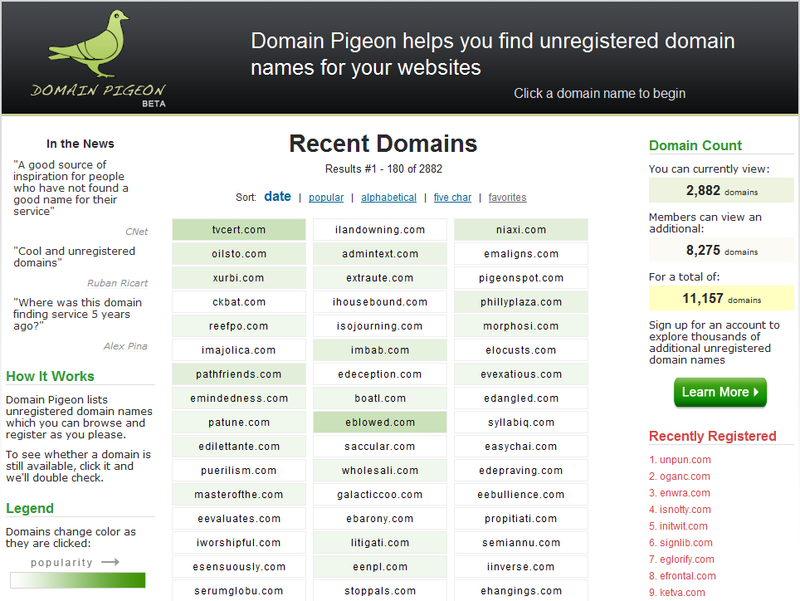 My hope was that one day Domain Pigeon would be the #1 result for people searching for unregistered domain names. After all, this would help direct a lot of traffic to the site, right? As I would soon figure out, no, it wouldn’t. How many people are actually looking for unregistered domain names? I would have guessed a lot. After all, thousands of people are looking for domain names so it would seem to make sense that people are also looking for innovative ways to find unregistered domain names as well. 1) Once you’ve brought up the Keyword Tool, type in a bunch of phrases related to the content of your site. I searched for domains, unregistered domain names, unregistered domains, available domains, and available domain names. 2) Check “Use Synonyms” and hit search. Google will then intelligently spit out a list of related search terms and numbers reflecting their competitiveness and search volume. 3) At this point, you can simply sort the results in your browser or download the results in order to do a more advanced analysis. I chose to export them to an Excel file. If you go this route, you’ll likely need to repeat the following process twice, one for the first set of results (“Keywords related to terms entered”) and one for the second set of results (“Additional keywords to consider”). Next, I combined these two lists into one by copying and pasting the data into a single sheet, then sorted them by Average Search Volume. 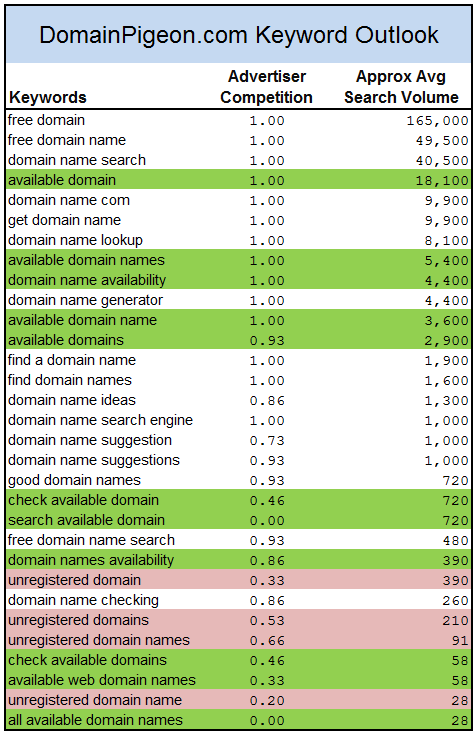 This process resulted in about 350 search terms, which I then went through and filtered based on phases that apply to Domain Pigeon. I highlighted the phrases that contain the word “available” in green and the ones with “unregistered” in pink in order to make the comparison clear. People aren’t searching for unregistered domain names; they’re searching for available domain names. While they mean the same thing, it turns out most people don’t actually use the word “unregistered”. It seemed natural to me to say “unregistered domain names” when people asked what Domain Pigeon was about so I used that phrase throughout the site, but most non-techies, who make up a much larger audience, would never say it that way. They are looking for “available domain names”. If you just compare the volume for those two phases, without counting the related ones, “available” is about a 60:1 favorite. What a difference a word makes. You can use this information to profitably adjust how you market your website, but be careful. The middle column, Advertiser Competition, reflects how many people you’re competing against for Google’s AdWords program but is also probably a good indication of how many competitors you have. If your goal is to purchase advertisements, you’re going to have a much harder time than if you just want to adjust the wording on your site. Also, somewhat ironically, rewording your site may actually decrease your traffic because of the increased competition you’re going to face with a more popular search term. In the case of Domain Pigeon, changing the word “unregistered” to “available” may make a big difference in the long run, especially when I add a blog and start producing content. Yes, it may wind up being more difficult reach one of the top search results, but hey, let’s see what happens. Posted on February 2, 2009 by Mazur. This entry was posted in Domain Pigeon. Bookmark the permalink.